Three keen sailors (Leo Wilson, Kit Jackson and Archie Screech-Dean) successfully completed their Level 2 Powerboat Handling at Oxford Sailing Club last weekend. The two-day course provided the skills and background knowledge needed to drive a powerboat on inland waters and is the basis of the International Certificate of Competence. The course focused on close-quarters boat handling, man overboard recovery, driving at planing speed and collision regulations. Despite the cold January temperatures, a large percentage of the weekend was spent out on the water in a range of different powerboats. Thankfully, Ms Rose was on hand to supply hot chocolates and cheese toasties to keep us all warm! The number of pupils participating in Sailing as their sport this term is more than double that of last term. We also have a number of Sailing Regattas in the calendar coming up. 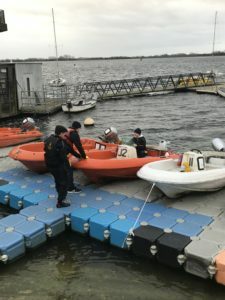 It was therefore essential that more of us held a PB2 licence so that more than one safety boat could be on the water during each of our Sailing sessions. 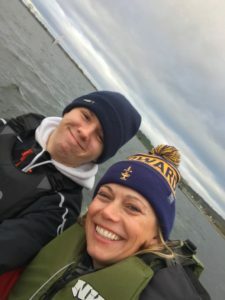 Joe Porter, Justus Dietrich and Ms Rose have all qualified previously so this has doubled the number of Powerboat drivers that we have available. If you are a keen sailor and would like to join the next PB2 course or if you have any questions relating to Sailing at St Edward’s, please contact Ms Rose.